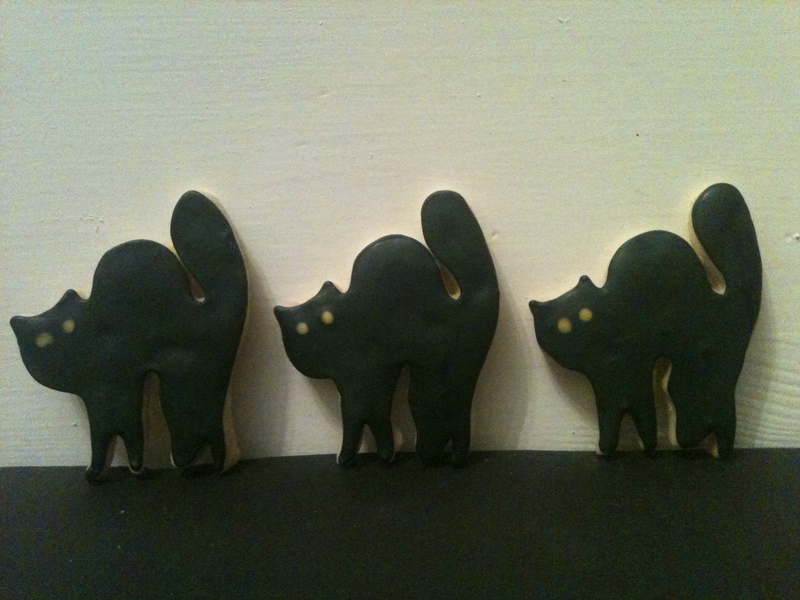 For the “trick or treaters” that came to my house this evening, at the weekend I made some Halloween biscuits. 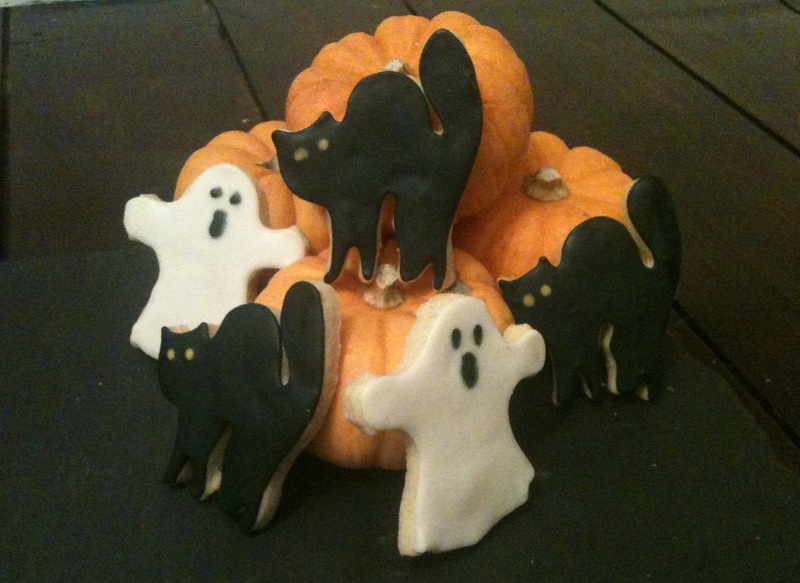 I made cats, ghosts, pumpkins and owls – but I ran out of time to decorate them all so I only finished off the ghosts and cats in time. Maybe I’ll get around to decorating the others this weekend! Trick or Treat? I was impressed with the chocolate biscuits I made from Boutique Baking the other week so I decided to try out Peggy’s orange biscuits. They were just as easy and just as tasty. They’re also perfect for making cut out biscuits because they maintain their shape really well – I’ve tried several recipes in the past which spread out when they cook and then ruin the shape of them. I think chilling them again after you’ve cut out the shapes probably helps so I think I’ll be doing this in future with other recipes. I decorated them using royal icing and the flooding technique – if you want to know how to do this click here. 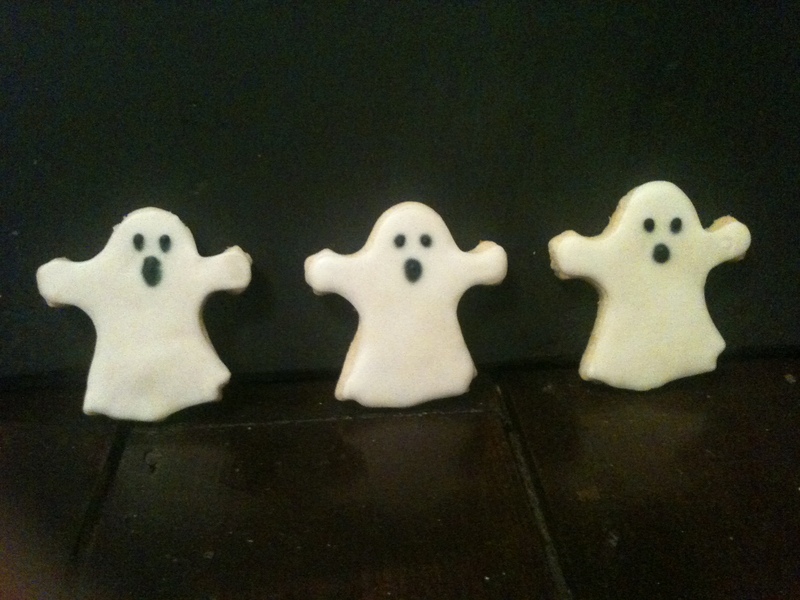 I piped the eyes onto them while they were still wet so that the eyes sank into the icing rather than sticking up. Place the butter, sugar, salt and orange zest in a mixer and beat together until smooth and creamy. Beat the egg in slowly until fully mixed in. Sift the flour in and mix until the dough just comes together. Bring the dough together in a ball, wrap in cling film and chill in the fridge for at least 30 minutes. Place the dough on a floured surface and knead briefly. Roll the dough out to about 2-3mm thick and then cut out the desired shapes. Place on a tray lined with greaseproof paper and then chill in the fridge for 30 minutes. Bake for 6-10 minutes (depending on the size of the biscuits) or until the biscuits are lightly browned around the edges. Once the biscuits are baked leave them to rest for 30 minutes. Once completely cool, decorate as desired.